Some 800 castles and mansions are spread all over South Tyrol, near Bolzano there is even the European area featuring the most castles. At the entrance of the Val Casies valley there is the oldest castle of upper part of the Val Pusteria: Castel Monguelfo. Rodengo Castle is located between Sciaves and Rio di Pusteria in the municipality of Rodengo, northeast of Bressanone. The castle complex is one of the most majestic fortresses of its time in South Tyrol, its origins date back to 1140. 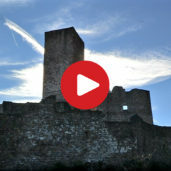 With the help of the drone we circle the magnificent castle and look behind the castle walls. Built in the 11th century and once seat of the Lords of Tyrol, Castle Tyrol is situated above Merano and was the eponym for the whole region. Today it hosts the South Tyrolean Cultural History Museum. 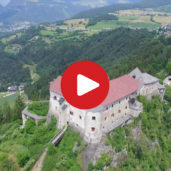 We took a look on Castle Tyrol from above. Above Sluderno in the sunny Val Venosta Valley, one of the best-preserved castles in South Tyrol can be found. 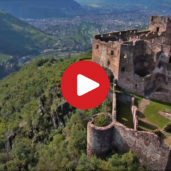 Located between the city of Merano and the Passo Resia, the castle boasts a massive armoury and almost mythical arcade passageways. The medieval manor near Fiè allo Sciliar has been mentioned for the first time in a document dating back to 1279 as “Castrum Presile”. For centuries it was the headquarter of the Lords of Fiè, an influential noble family. Nowadays, Castel Presule is the venue for cultural events and exhibitions and is open to the public: guided tours can be organized during the summer months. The history of Castle Trostburg goes back as far as the 12th century. It is excellently preserved and is almost certainly one of the most visited castles in all of South Tyrol. Keeping the castle in perfect condition, is Terese Gröber, who has been living here since childhood. Although lacking in modern amnesties, Terese „Tresl“ would not want to miss a single day here and today we go on a special tour with her. 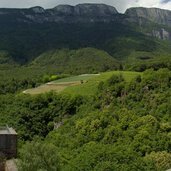 A comfortable hike on a circular route is a great way to discover a few cultural gems that the Val Venosta valley has to offer. Castle ruins, churches and chapels are only some of the things to be admired. A perfect way to spend some time, bridging the gap between winter and spring. At the entrance to the Val Sarentino, the impressive Rafenstein dominates Castle Runkelstein and the city of Bolzano. Flying over the Haderburg Castle, on a high rock spur above Salorno, at the southern gates of South Tyrol. This view from above offers a breathtaking picture of a varied cultural and natural landscape: golfers among medieval castle walls and the autumnal scenery invite to join in. The mighty Castel Flavon looks down from a rock spur on the rooftops of Bolzano. The ruin of Castelchiaro, or Castel Leuchtenburg, seems to mount guard over Lake Caldaro.